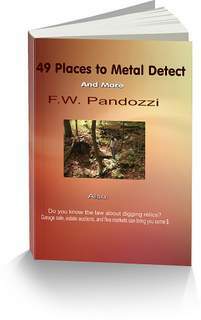 Metal detecting rules exist in some states, towns and villages. Sometimes they are called “laws“, or “ordinances“. States have laws that deal with the removal of artifacts on state or federal lands. These laws date back to 1906. There are also metal detecting clubs and organizations that have their own sets of rules. Members of these groups are asked to follow those guidelines when detecting. The main reason why the rules of these organizations were created, was to promote the metal detecting hobby in a positive manner. Over the years there has been an increased amount of pressure from beauracrats and archaeologists to shut down the hobby. There are many reasons why there has been this overload of negative action and comments from these people, the main issue being that archaeologists feel threatened because many amateurs with metal detectors are digging up history. And the archaeologists want that history for themselves. So rules have been set in place for the detectorist to follow so as not to offer any reason for the archaeologist to find fault. For instance. One rule to follow that is very important, is to make sure you that you fill in each and every hole you dig. If you are in a public park and you leave a hole or holes open, and someone of authority sees it, the park could then be shut down to metal detecting. Metal detecting rules also make reference to making sure that you ask for permission if you want to metal detect on private property. In addition, some rules state that you will not destroy any property on public or private lands. And that you will always treat the lands, and their natural resources with respect. There are people who abuse the hobby of metal detecting. By that I mean they trespass onto state parks that are off limits to detecting, or they go onto battlegrounds like Gettysburg and metal detect while also leaving large holes unfilled. In doing so those individuals are leaving a bad impression on the hobby, and lending more fuel to fire for those archaeologists who want to close down the hobby. That is why it is so important to follow all metal detecting rules. Each state has a different set of rules that govern how, when, and where you are to detect in a state park. It’s imperative that before you set out to detect in one of these parks, that you check with the parks commission of your state. Most times you will need a permit to metal detect. Some states are completely off limits to detecting. That is why it’s important to check first. Many times there are no signs against metal detecting, posted in city, town, or village parks. But that does not mean you can legally detect there. Too many times I have heard of individuals detecting in a park where there were no signs, only to have a policeman tell them it was off limits. There may be metal detecting rules for that park, and you find out after you were told to stop. Once again, like state parks, check first to see if there are any laws against metal detecting in one of these areas. When filming my TV series, the archaeologists lied about where I was digging. Metal detecting rules must be followed in these areas as well.